In an opening-day display as emphatic as any in previous World Cup, New Zealand mauled Sri Lanka by 98 runs at the Hagley Oval. A New Zealand win was the expected result leading up to the game, but perhaps not a win this massive, by a margin that highlighted the strength in depth in one camp as sharply as the shortcomings in the other. 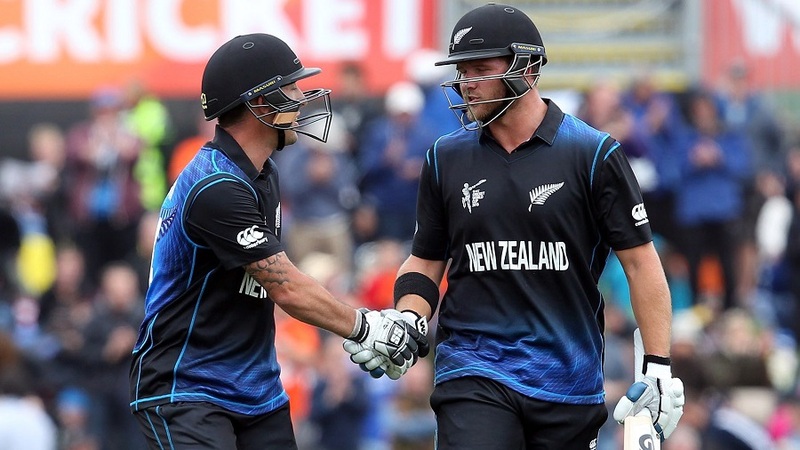 Blazing half-centuries from Brendon McCullum and Corey Anderson and solid contributions from most of the other batsmen propelled New Zealand to a total of 331, and the bowlers showed both control and incision in its defence. This was best exemplified by the full, swinging missiles from Trent Boult that aborted the two most promising innings in Sri Lanka's chase. Lahiru Thirimanne, striking the ball crisply with a high front elbow - even while ramping an Adam Milne bouncer over the keeper - was batting on 65 off 59 balls when Boult snaked a full outswinger past his hastily jabbing bat and into his off stump. In his next over, Boult swung one the other way to smack Kumar Sangakkara's front pad, just about in line with off stump, as he walked down the pitch to the left-arm quick. Sangakkara, with scores of 76, 9, 81 and 113* in his last four innings against the same attack only last month, was batting with the same sort of fluency when Boult cut his innings short at 39. In between Boult's strikes, Daniel Vettori had spun one sharply to have Mahela Jayawardene caught behind for a duck. Thirimanne had put on 67 with Tillakaratne Dilshan for the first wicket, and his second-wicket stand with Sangakkara had taken Sri Lanka to 124 for 1 in the 22nd over. When Boult dismissed Sangakkara, Sri Lanka were 129 for 4 and sinking. Their lower-middle order hasn't contributed anything of note in the recent past and the trend continued, and Sri Lanka slowly sunk to 233 all out, the match ending with 23 balls still remaining. After being asked to bat, New Zealand plundered 77 in their first 10 overs and 102 in their last 10, and might have made a tilt at 400 had Sri Lanka's bowlers not managed to exert some sort of control during the middle overs. Between overs 11 and 40, they picked up four wickets and conceded only 5.07 runs per over. But the damage done by McCullum at the start of the innings and by Anderson at the end left the biggest impact upon the scorecard. Lasith Malinga, returning to ODI cricket for the first time since undergoing ankle surgery in September, showed the effects of his layoff in spraying the ball around and conceding 84 from his 10 overs, and his new-ball and death-overs partner Nuwan Kulasekara took even more punishment, leaking 78 in eight. Sri Lanka's fielding did them no favours either. Four catches went down, all at junctures when a wicket could have swayed the momentum of the innings. Malinga's radar was all over the place during his first spell, and he had already conceded 19 when he began his fourth over with a waist-high full-toss. McCullum dispatched it to the leg-side boundary. Then came a no-ball on the pads. McCullum clipped it for another four. The free-hit was a slower ball, right in the slot for McCullum to clear his front leg and launch down the ground for six. Two more fours came off the last two balls, and the over had produced 23 runs. McCullum had scored 22 of them - only Virat Kohli, during his blazing century in Hobart three years ago, had scored more in an over against Malinga. Sri Lanka turned to Rangana Herath in the 10th over, and he brought some measure of normalcy to proceedings before getting McCullum to hole out by daring him to go after a ball that wasn't quite full enough to hit over the top with full control. It gripped, turned, and McCullum didn't quite middle it; long-off still took it right on the edge, while threatening to topple over the rope. Suranga Lakmal came on as Sri Lanka's fourth-change bowler, and immediately looked the most impressive of their seamers, immediately finding Kane Williamson's edge with a fullish outswinger, only for Sangakkara to put him down, diving to his right. In near-identical circumstances six overs later, Sangakkara managed to pouch Martin Guptill. Williamson wasn't batting with his usual fluency - early in his innings, he French-cut Lakmal for four and nearly popped a return catch to Herath - but Sri Lanka wouldn't let him leave the crease. When he was on 27, Angelo Mathews leaped at short cover and got a hand to a powerful slap off Lakmal but couldn't hold on. Sri Lanka had to wait till he had doubled his score when Williamson finally offered another chance, holing out at the wide long-on boundary off the legspinner Jeevan Mendis. Mendis held his next delivery back a touch, and released from a foot behind the crease. Ross Taylor, lunging out of his crease to flick against the turn, was beaten by dip and turn, and Sangakkara stumped him after a bit of a juggle. At the end of that over, Mendis had figures of 2 for 5 from two overs. For some reason, he didn't bowl another ball. Anderson and Grant Elliott, the two new batsmen, took 33 from the batting Powerplay, which left New Zealand 229 for 4 at the 40-over mark. Elliott fell in the 44th over, and Anderson skied Lakmal high over cover in the 46th over to give Sri Lanka a chance of restricting the score to under 300. Mendis settled under the ball and dropped a sitter. Anderson was on 43 at that point, New Zealand on 278. They scored 50 off the 27 balls that remained, which gave Sri Lanka just enough time for one last act of tragicomedy, Malinga overstepping while bowling Ronchi with a perfect yorker.